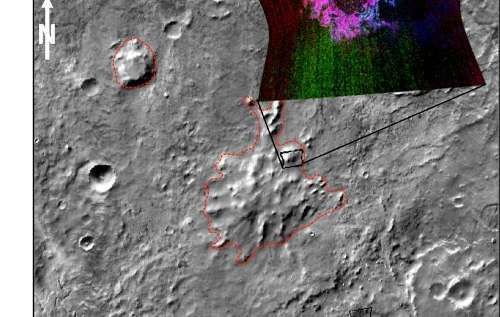 Volcanoes erupted beneath an ice sheet on Mars billions of years ago, far from any ice sheet on the Red Planet today, new evidence from NASA’s Mars Reconnaissance Orbiter suggests. 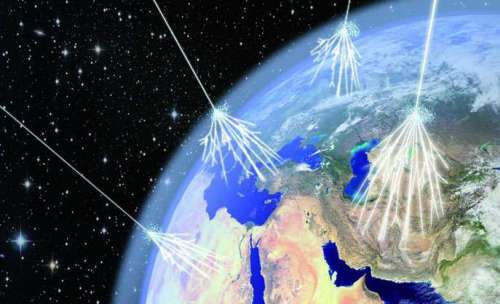 The Earth is under constant bombardment by subatomic particles called cosmic rays, including some, known as ultra-high-energy cosmic rays, which pack much more punch than the world’s most powerful particle accelerators. Fortunately, Earth’s atmosphere protects us by dissipating most of that energy before it reaches the ground. But where do these ultrafast cosmic rays come from, and how are they accelerated to such high energies—one quadrillion (1015) electron volts and more? Scientists have been searching the heavens for answers to those questions for many decades, yet much about the origin and nature of ultra-high-energy cosmic rays remains a mystery. Now an international team of researchers is trying a different approach. Instead of looking deep into the universe with telescopes, or trying to capture the debris from atmospheric cosmic-ray collisions with particle detectors, they’re trying to duplicate the actual conditions that could contribute to cosmic-ray acceleration right here on Earth, in the National Ignition Facility (NIF) target chamber. In a NIF discovery science campaign conducted by the Astrophysical Collisionless Shock Experiments with Lasers (ACSEL) collaboration, the researchers are carrying out a series of experiments aimed at understanding the possible role of collisionless shocks and related intergalactic magnetic fields in cosmic-ray acceleration. In collisionless shocks, the charged particles in a plasma (a medium consisting of freely moving ions and free electrons) pass by largely without colliding with each other; such shocks occur in many astrophysical phenomena including supernova remnants, gamma-ray bursts and jets from active galactic nuclei. NIF is the only facility capable of creating plasmas with sufficiently high density (greater than 1020 particles per cubic centimeter), high flow velocity (greater than 1,000 kilometers per second) and high temperature (greater than 1,000 electron volts) to conduct these experiments. In the scaled NIF experiments, the collisional mean free path—the average distance traveled by a particle between collisions with other particles—is much larger than the experimental volume, yet the collisionless shocks created are similar to the astrophysical conditions observed in space. The two most recent ACSEL experiments studied high-speed collisionless shock formation by firing more than 125 NIF beams at targets composed of two plastic foils facing each other. The associated magnetic field was backlighted, or probed, by protons from a tiny laser-irradiated sphere known as an “exploding pusher” target filled with a mixture of deuterium and helium-3 (D3He). This series of experiments was the first to use the D3He-filled exploding pusher, which was developed in collaboration with the Massachusetts Institute of Technology (MIT) Plasma Science and Fusion Center, as the proton backlighter for a physics experiment on NIF. Imagine trying on new pair of spectacles and when glancing around to test them you spot a monster—that’s exactly what happened when the ASKAP antennas were turned towards a group of three merging galaxies 1.8 billion light years away. The monster concerned is a supermassive black hole with a mass 3 billion times that of the Sun. All galaxies are believed to house a huge black hole at their centre, but this one is gigantic by cosmic standards. It is 750 times bigger than the black hole at the centre of the Milky Way—which is a modest 4 million solar masses. 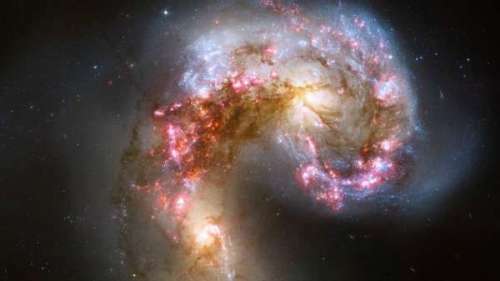 Black holes grow by drawing in material including other black holes that venture too close, and in this case the black holes from the three galaxies have merged. 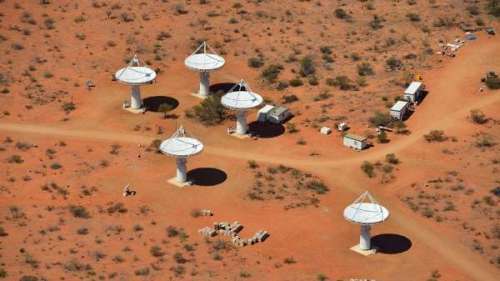 Dr Lisa Harvey-Smith from CSIRO Astronomy and Space Science and her team knew of a strong source of radiowaves, known as an astrophysical maser, in the group and pointed the array of antennas toward it. The results were checked by the Australia Telescope Compact Array telescope at Narrabri which found the gas forming the maser was moving at around 600 kilometres per second, or around 500 times the speed of a rifle cartridge. Knowing the speed of the gas they were able to directly measure the mass of the black hole that was causing the gas to swirl. ASKAP (the Australian Square Kilometre Array Pathfinder) is the precursor to the Square Kilometer Array and is being built in the Murchison. When finished ASKAP will have 36 identical antennas, each 12m in diameter that will work together as a single instrument. “The full 36 antennas will be online by 2018,” Dr Harvey-Smith says. Dr George Heald who leads the CSIRO Astrophysics group in Perth says ASKAP’s advantage lies in sporting CSIRO’s own receiver technology called Phased Array Feed (PAF), which is like a digital camera for use in radio astronomy. “It allows us to map a huge area of the sky a lot faster than by using a traditional radio telescope,” he says. Perth team member Aidan Hotan says that most of the science planned for ASKAP has to do with understanding the structure and composition of the universe out to greater distances and over wider areas than ever before. Pluto has some characteristics less like that of a comet and more like much larger planets, according to an analysis of Pluto’s unique interaction with the solar wind, scientists say. Using data from an instrument aboard the New Horizons spacecraft gathered on its Pluto flyby in July 2015, scientists have observed the material coming off of Pluto and seen how it interacts with the solar wind, and found it completely new – and unexpected. “This is a type of interaction we’ve never seen before anywhere in our solar system,” said David J. McComas, lead author of the new study published today in the Journal of Geophysical Research – Space Physics, a publication of the American Geophysical Union. McComas, professor in Princeton University’s Department of Astrophysical Sciences and vice president for the Princeton Plasma Physics Laboratory, leads the Solar Wind Around Pluto (SWAP) instrument aboard New Horizons; he also led development of SWAP when he was at the Southwest Research Institute (SwRI) in Texas. The research was funded as a part of the New Horizons project by NASA. Space physicists say that they now have a treasure trove of information about how Pluto’s atmosphere interacts with the solar wind. Solar wind is the plasma, or charged particles, that spews off from the sun into the solar system at a supersonic 400 kilometers per second (1 million miles per hour), bathing planets, asteroids, comets and interplanetary space in a soup of mostly electrons and protons. “The results are astonishing. We were fascinated and surprised” by the findings, McComas said. Previously, most researchers thought that Pluto was characterized more like a comet, which has a large region of gentle slowing of the solar wind, as opposed to the abrupt diversion solar wind encounters at a planet like Mars or Venus. Instead, like a car that’s part gas- and part battery-powered, Pluto is a hybrid, the researchers say. Pluto continues to confound. Since it’s so far from the sun – an average of about 5.9 billion kilometers (3.7 billion miles) – and because it’s so small, scientists thought Pluto’s gravity would not be strong enough to hold heavy ions in its extended atmosphere. But, “Pluto’s gravity clearly is enough to keep material sufficiently confined,” McComas said. Further, the scientists found that very little of Pluto’s atmosphere is comprised of neutral particles converted to electrically charged ions and swept out into space. 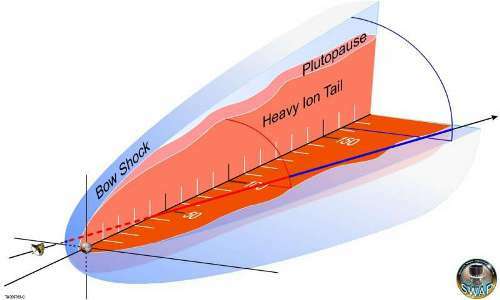 – Pluto has a very thin “Plutopause” – or boundary of Pluto’s tail of heavy ions and the sheath of the shocked solar wind that presents an obstacle to its flow. Heather Elliott, astrophysicist at Southwest Research Institute and co-author on the paper, said that the study provides interesting comparisons. 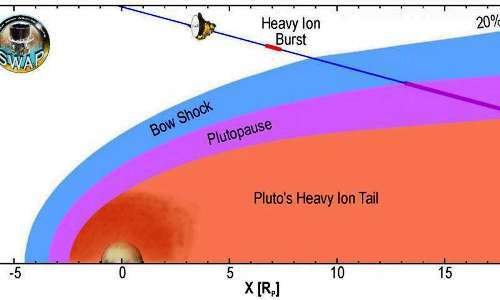 “Comparing the solar wind-Pluto interaction to the solar wind-interaction for other planets and bodies is interesting because the physical conditions are different for each, and the dominant physical processes depend on those conditions,” Elliott said. What is significant, McComas said, is the range of diversity that bodies in the solar system have with the solar wind. Further, the findings offer clues to the magnetized plasmas that one might find around other stars. “The range of interaction with the solar wind is quite diverse, and this gives some comparison to help us better understand the connections in and beyond our solar system,” McComas said. New Horizons is the first mission in NASA’s New Frontiers program, managed by the agency’s Marshall Space Flight Center in Huntsville, Ala. The Johns Hopkins University Applied Physics Laboratory designed, built, and operates the New Horizons spacecraft and manages the mission under Principal Investigator Dr. Alan Stern’s direction for NASA’s Science Mission Directorate. SwRI leads the science mission, payload operations, and encounter science planning. The NASA Heliophysics program also supported the analysis of these observations. The shock is traveling with an astonishing speed of 2,700 kilometers per second, about three times the local speed of sound in the cluster. By comparison, NASA’s Juno spacecraft in 2013 became the fastest human-made object when it was slingshot around Earth toward Jupiter at a relatively pedantic 40 kilometers a second. “Studying mergers of galaxy clusters has proven to be crucial to our understanding of how such large scale objects form and evolve,” says Dasadia. 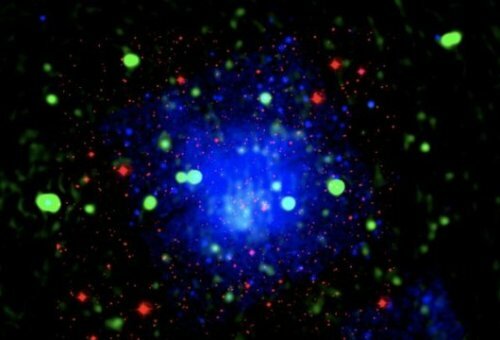 Shocks provide unique opportunities to study high-energy phenomena in the intra-cluster medium — the hot plasma between galaxies. “This could open a door, where people can do a number of different studies based on what I have found,” Dasadia says. Already, scientists are targeting shocks in galaxy clusters to study dark matter, the magnetic field in the intracluster space, particle acceleration and energy transfer in the intracluster medium. In only 10 days, Dasadia’s research was accepted for publication by The Astrophysical Journal Letters. Dasadia recently received one year of research support from the Alabama EPSCoR Graduate Research Scholars Program (ALEPSCoR). He also gave an oral presentation on his research in August at the International Astronomical Union (IAU) General Assembly in Honolulu, Hawaii. The universe is populated with galaxy clusters that are relaxed and unrelaxed, Dasadia says. The relaxed ones are mellow — they’ve been around a lot longer, have seen lots of past mergers and really aren’t dynamically active. It’s the unrelaxed clusters like Abell 665 that are good candidates to study merger features such as shocks and turbulence. If talking about fronts and shock waves and temperature differentials sounds lot like the weather on Earth, Dasadia says that’s because there is not much difference as far as the physics involved. He was able to measure the velocity of the collision and the dynamics of what is happening in it — or rather, what was happening in it. It took 3.2 billion years for the light in the observations to reach Earth, so the events all happened that far back in time. Dynamic observations included the energy in the collision, the gas movement, and measurements of the discrepancy between the visible and dark matter involved. Geochemists from Trinity College Dublin’s School of Natural Sciences may have found a solution to a long-debated problem as to where — and how — life first formed on Earth. In a paper just published in the journal Geochimica et Cosmochimica Acta, the team proposes that large meteorite and comet impacts into the sea created structures that provided conditions favourable for life. Water then interacted with impact-heated rock to enable synthesis of complex organic molecules, and the enclosed crater itself was a microhabitat within which life could flourish. It has long been suggested that the meteoritic and cometary material that bombarded the early Earth delivered the raw materials — complex organic molecules, such as glycine, β-alanine, γ-amino-n-butyric acid, and water — and the energy that was required for synthesis. The Trinity group’s work has provided the new hypothesis that impact craters were ideal environments to facilitate the reactions that saw the first ‘seeds of life’ take root. The research was part of a wider project funded by Science Foundation Ireland and led by senior author, Professor of Geology and Mineralogy at Trinity, Balz Kamber. Although no very ancient terrestrial impact structures are preserved, the Sudbury basin provides a unique opportunity to study the sediment that filled the basin as a guide to what the earlier impact craters would have looked like. 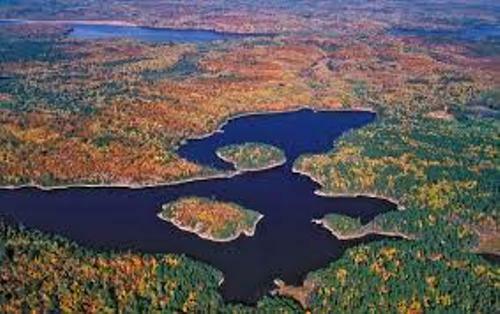 The Sudbury structure is distinctive among the known terrestrial impact craters. It has an unusually thick (nearly 2.5 km) basin fill, and much of this is almost black in colour (due to carbon) containing also hydrothermal metal deposits. Representative samples across the basin fill were analysed for their chemistry and for carbon isotopes, and they revealed an interesting sequence of events. The first thing that became evident was that the crater was filled with seawater at an early stage, and remained sub-marine throughout deposition. Importantly, the water in the basin was isolated from the open ocean for long enough to deposit more than 1.5 km of volcanic rock and sediment. The lower fill is made up of rocks that formed when the water entered the crater whose floor was covered by hot impact melt. Fuel-coolant reactions deposited volcanic rocks and promoted hydrothermal activity. Above these deposits, reduced carbon starts to appear within the basin fill and the volcanic products become more basaltic. Previously the puzzling presence of carbon in these rocks was explained by washing in from outside the crater basin. However, the new data show that it was microbial life within the crater basin that was responsible for the build-up of carbon and also for the depletion in vital nutrients, such as sulphate. “There is clear evidence for exhaustion of molybdenum in the water column, and this strongly indicates a closed environment, shut off from the surrounding ocean,” added Edel O’Sullivan. Only after the crater walls eventually collapsed did the study show replenishment of nutrients from the surrounding sea. These sub-marine, isolated impact basins, which experienced basaltic volcanism and were equipped with their own hydrothermal systems, thus present a new pathway to synthesis and concentration of the stepping stones to life. New research by astronomers at the Harvard-Smithsonian Center for Astrophysics (CfA) examines a number of scenarios and finds that most of them have low probabilities. Therefore, the presence of Planet Nine remains a bit of a mystery. 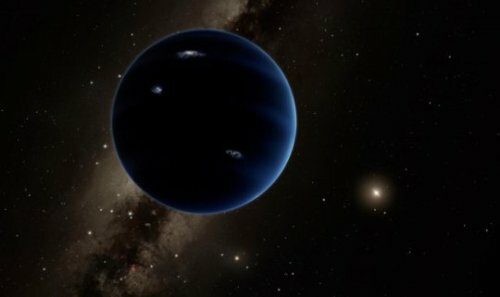 “The evidence points to Planet Nine existing, but we can’t explain for certain how it was produced,” says CfA astronomer Gongjie Li, lead author on a paper accepted for publication in the Astrophysical Journal Letters. Planet Nine circles our Sun at a distance of about 40 billion to 140 billion miles, or 400 — 1500 astronomical units. (An astronomical unit or A.U. is the average distance of the Earth from the Sun, or 93 million miles.) This places it far beyond all the other planets in our solar system. The question becomes: did it form there, or did it form elsewhere and land in its unusual orbit later? Li and her co-author Fred Adams (University of Michigan) conducted millions of computer simulations in order to consider three possibilities. The first and most likely involves a passing star that tugs Planet Nine outward. Such an interaction would not only nudge the planet into a wider orbit but also make that orbit more elliptical. And since the Sun formed in a star cluster with several thousand neighbors, such stellar encounters were more common in the early history of our solar system. However, an interloping star is more likely to pull Planet Nine away completely and eject it from the solar system. Li and Adams find only a 10 percent probability, at best, of Planet Nine landing in its current orbit. Moreover, the planet would have had to start at an improbably large distance to begin with. CfA astronomer Scott Kenyon believes he may have the solution to that difficulty. In two papers submitted to the Astrophysical Journal, Kenyon and his co-author Benjamin Bromley (University of Utah) use computer simulations to construct plausible scenarios for the formation of Planet Nine in a wide orbit. “The simplest solution is for the solar system to make an extra gas giant,” says Kenyon. They propose that Planet Nine formed much closer to the Sun and then interacted with the other gas giants, particularly Jupiter and Saturn. A series of gravitational kicks then could have boosted the planet into a larger and more elliptical orbit over time. That could be avoided by interactions with the solar system’s gaseous disk, he suggests. Kenyon and Bromley also examine the possibility that Planet Nine actually formed at a great distance to begin with. They find that the right combination of initial disk mass and disk lifetime could potentially create Planet Nine in time for it to be nudged by Li’s passing star. Li’s work also helps constrain the timing for Planet Nine’s formation or migration. The Sun was born in a cluster where encounters with other stars were more frequent. Planet Nine’s wide orbit would leave it vulnerable to ejection during such encounters. Therefore, Planet Nine is likely to be a latecomer that arrived in its current orbit after the Sun left its birth cluster. Finally, Li and Adams looked at two wilder possibilities: that Planet Nine is an exoplanet that was captured from a passing star system, or a free-floating planet that was captured when it drifted close by our solar system. However, they conclude that the chances of either scenario are less than 2 percent.